WeatherBoards™ Lap Siding is manufactured to look like natural wood, providing bold and traditional profiles. Our grain pattern repeats every 48 planks – the best in the industry – which means a 20x24-foot wall, will have a maximum of only two repeats. Innovative engineered material technology creates a product that is non-combustible, resists UV rays and moisture, is impervious to wood-boring insects, resists damage from everyday impacts and will not warp or rot. You also get the best of both worlds with an authentic wood look architectural board developed through building science to protect your home against the weather. WeatherBoards Lap Siding is available in a smooth, textured, Dutchlap or beaded profile to perfectly match your home’s style. Color reflects your personality and lifestyle. Color is important to you, that’s why CertainTeed leaves nothing to chance. 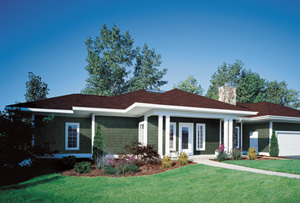 Lap Siding can be prefinished with CertainTeed’s proprietary ColorMax Finishing System which provides a spectrum of design possibilities with 16 attractive solid colors. First we apply FiberTect®, our proprietary primer/sealer that is engineered to seal against moisture. Next, as a finishing coat, ColorMax Solid Colors provide coverage against the elements and enhance the deep, natural grain pattern of CertainTeed WeatherBoards. All are factory-applied for maximum consistency and performance, and allows for faster job completion. Classic detail and sophisticated silhouettes with long lines create an easy elegance.